Written on August 8, 2006, and categorized as Secret and Invisible. I’ve always thought this was one of the weirder and more misguided ad campaigns ever. It somehow suggested that if you ate the uniquely shaped chocolate bar, you would be cast into psychedelic isolation. The merry song tripped along mentioning triangular people, triangular honey, triangular bees, triangular smells, all set in a colour-saturated saccharine and disturbing triangular cartoon animation hell worthy of the son of the clone of Bob Godfrey. I wish I could find a copy of it. Toblerone ads have always been bizarre. I get the impression that the only way Ad People are allowed to encourage the company to distinguish and sell this confectionery product is by it’s shape.. this is the way it has always been since Mr Tobler had the wonderful, inventive, and typically SWISS IDEA of a non-rectangular choc bar, and any marketing utilising this feature and thus keep the Toblerone profile in place is acceptable, even if it puts you off eating the stuff. This makes me anticipate the delicious combination of chocolate, honey and nougat ? No. It makes me want to perform the Heimlich Manoeuvre as a preventative measure. And because Toblerone have always traded on the eccentric, they attract freaks from all over the world… not nice, funny, interesting freaks however.. just freaks ! The Toblerone flog stands one before the judge, can from sport equipment fast a weapon become. Does this danger exist also with a large Schokoriegel? If one has cousin a ball racquet in the car to lie, it can be which one with police control annoyance gets. Is a large Schokoriegel, which policeman to assume which one these used as weapon, how suspicious? Actually, I do quite like Toblerone. Oops. 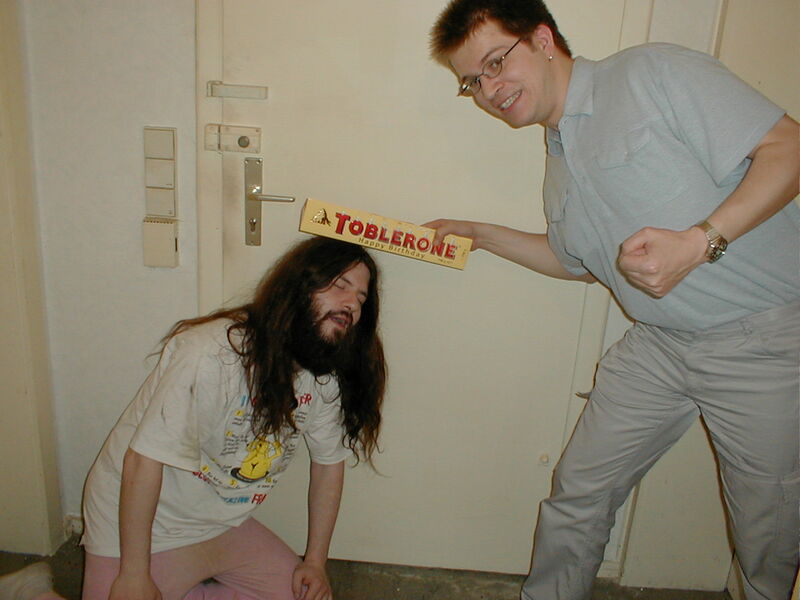 Toblerone is by a long way the most read article in Blog of Funk. As you may have noticed, I have studiously avoided writing populist prose about chocolate since that time. You might be interested in reading the comments on the original post though… the German people commented to explain their use of the chocolate as a weapon, as did the man who sang the TV jingle. And I do still like Toberone, especially the dark chocolate ones. When I’m king, all weapons will be made of chocolate.